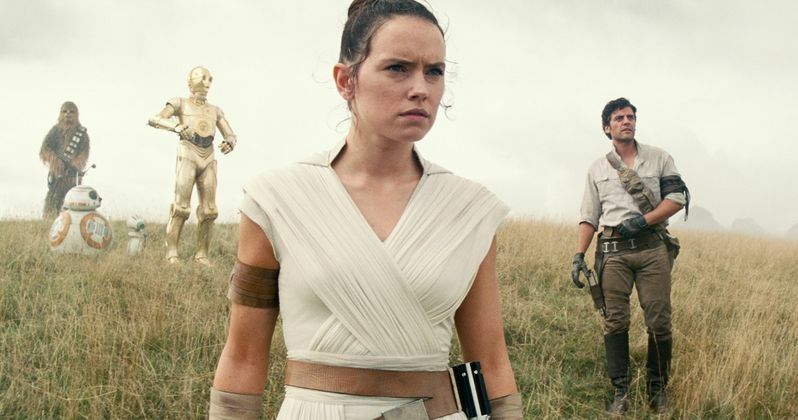 The first trailer for Star Wars 9 is here. Disney purchased Lucasfilm in 2012 at a time when it seemed like we had seen the last of a galaxy far, far away on the big screen. But their $4 billion mega-purchase from George Lucas ensured that the franchise would live on for years and years to come. But as for the Skywalker saga that we've been following ever since 1977? Well, if we're to take the studio at their word, this is going to be the end of that saga. At the very least, it's the end of this first new trilogy during the Disney era of Star Wars and, to say the least, it's a significant moment in the franchise's long history. Up to this point, the studio has been very shy about showing their hand. These Star Wars movies, or any big blockbuster for that matter, tend to be pretty secretive. But this feels especially locked up tight. This footage gives us our first real indication of what to expect, especially considering the studio didn't even reveal the title ahead of Star Wars Celebration. Can Kylo Ren be redeemed? Will Rey successfully rebuild the Jedi order? Can the Resistance topple the First Order even though, when last we saw them, the organization was in shambles? So many questions, even with this trailer. What we know for sure is that there is a ton of pressure for this movie to deliver. J.J. Abrams got this new era of Star Wars off to a solid, if safe start with The Force Awakens in 2015, which grossed more than $2 billion worldwide. Then Abrams passed the torch to Rian Johnson for episode VIII, which we would come to know as The Last Jedi. More than a year later, it remains the most divisive movie in the history of the franchise. Abrams admitted recently he was reluctant to return for this movie. It's understandable why. Love it or hate it, Disney wants a movie that can unite the fanbase once again. After Jurassic World director Colin Trevorrow departed the project, J.J. Abrams was brought back on board to finish what he started. He's bringing some familiar faces with him in the form of Mark Hamill who is back as Luke Skywalker (because Jedi never really die), Billy Dee Williams is finally coming back as Lando Calrissian, Anthony Daniels is returning as C-3PO and, most impressively, Carrie Fisher will once again return as Princess Leia, with Abrams using footage from The Force Awakens and The Last Jedi to bring her back for one last go around.